Since changing my diet, sushi is definitely one of the things I miss a lot and sadly, vegetarian sushi is often limited to the usual egg, cucumber, and Inari [sweet Japanese bean curd skin] toppings in comparison to the plethora of choices that non-vegetarians have. On top of the lack of choices, I also have since become unable to justify the cost for a little rectangular block of rice with a small piece of cucumber, in comparison to a generous slice of sashimi a top the same block of rice. As a result of this, I have since cut down significantly on my sushi meals. 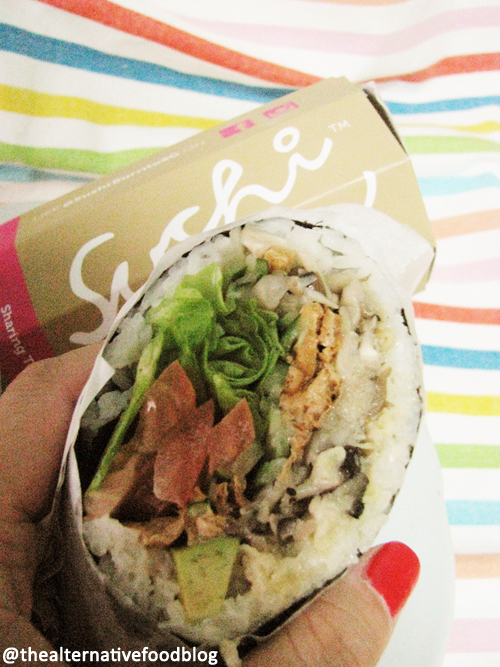 As luck would have it, I chanced upon a photo a friend uploaded on Facebook where she ordered a sushi burrito for lunch. 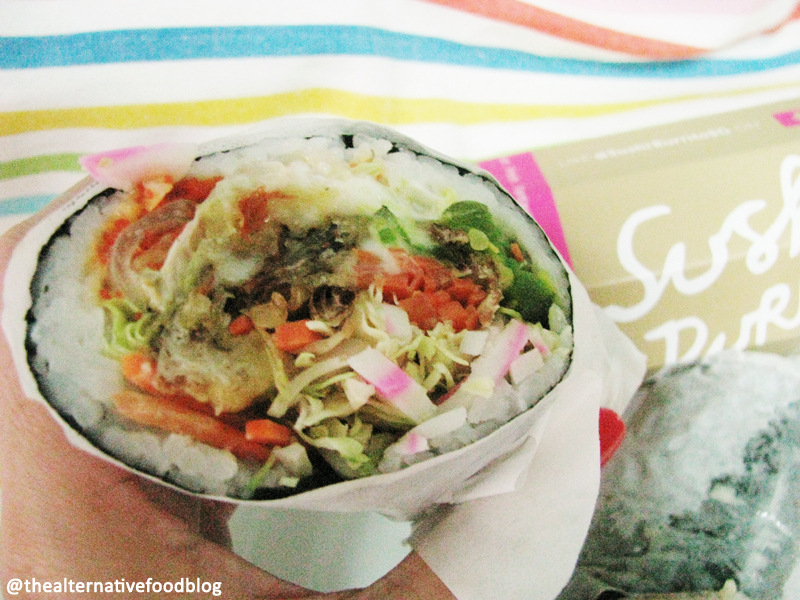 Visible from the picture itself, a sushi burrito is a Mexican-inspired burrito made with, you guessed it, sushi rice instead of the traditional wrap. Intrigued, I sent her a message about where she got it from and asked her how her sushi burrito tasted, and got some recommendations from her. I then sent Sushi Burrito, where my friend purchased her meal, a message on Facebook to check if they were Halal-certified and if they offered vegetarian options. Unfortunately, I was told that they were not Halal-certified so Shereen had to sit this review out. However, they shared that they do offer vegetarian options. Needless to say, when I heard that their Japanese-Mexican menu carried vegetarian options, I was very excited and made my way down to their restaurant at 100AM Mall, a brand new mall at Tras Street . Despite being tucked in a small corner of 100AM mall, it is hard to miss Sushi Burrito with its edgy black and fuschia storefront. The interior is small and can seat about 28 people (there is no outdoor seating). The tables are small and arranged close to one another, so it may not be the perfect place for quiet and cozy meal times. Given this, I decided to order takeaways and got my family members to help with the food tasting. I ordered a full-size Veggie Green -257kcal (SGD $10.90 for a full burrito, SGD $5.90 for a half-burrito), a full-size Crabby Crunch -281kcal (SGD $12.90 for a full burrito, SGD $6.90 for a half burrito), and a side dish of Shishamo Karaage (SGD $5.90). While I was waiting for my orders, I studied their menu and noticed that most of the main dishes were seafood-based sushi, with a vegetarian option of the Veggie Green. There were a few side dishes and desserts to choose from, with the Forest Salad, Edamame [steamed soybeans in pod], the Pitan Tofu [cold silken tofu with century egg], and a few others suitable for ovo-lacto vegetarians like myself. I also observed that each dish had their calorie count stated next to it on the Mains menu. That was not surprising as the calorie information is in line with the restaurant’s vision to provide fresh and healthy food. I also observed that Sushi Burrito did not charge the usual Goods and Services Tax (GST) of 7 per cent or Service Charge of ten per cent and that was definitely a plus for me considering it being a casual dining establishment. After waiting for about 15 minutes, my order was ready. It may seem like a long wait for sushi and a side dish, but to be fair, I did drop in during the crew’s dinner time, so that may account for the longer time taken to prepare my order. As I was leaving, I checked with one of the staff if I needed to consume the sushi burritos within a stipulated time and she informed me that they were best eaten within 30 minutes, and if I do want to eat them at a later time, it was best to keep them refrigerated. I roped in my mother and my brother to help with the food tasting and they were impressed with the quantity of it all. To quote my mom “The burritos are so huge, it’s possible for it to be a meal on its own,” and true enough, the sushi burritos are packed with fresh vegetables, mushrooms, and seafood. To start off, my mom and I tried the Veggie Green – a sushi burrito with sauteed mushrooms, lettuce, cucumbers, avocados, tomatoes, and Inari as fillings. The lettuce and cucumbers were fresh and crunchy, while the creaminess of the avocados complimented the crunchy salad. The sauteed mushrooms were peppery and their freshness was not overpowered by excessive seasoning. While we both agree that the ingredients used were fresh, it didn’t taste like real sushi. We couldn’t detect any rice vinegar or mirin in the rice , and it was rather disappointing for us as we thought the rice tasted like plain short grain rice. My brother tried the Crabby Crunch and he was impressed with the way the soft shell crab was prepared. According to him, the soft-shell crab was still crunchy despite it being sometime since it was prepared. The soft-shell crab was fresh and did not have a fishy taste that soft-shell crabs sometimes have. As for the mix of lettuce, pickles, avocado, cabbage, and ebiko [prawn roe], he was pleased that the vegetables were fresh, and that it was worth the money. He too mentioned that he could not taste any vinegar or mirin in the rice, and even commented that it tasted like the rice rolls we could get at the popular Taiwanese franchise, QQ rice. There was still the Shishamo Karaage. 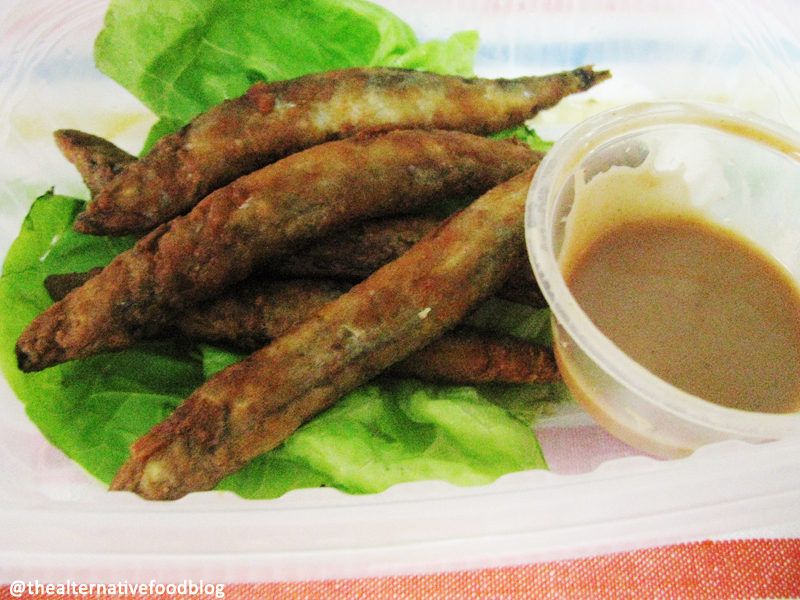 Shishamo is the Japanese word for smelt, a small fish that resembles a willow leaf. Usually, in good Japanese restaurants, this type of fish is deep fried to perfection, and when you bite into it, you will be greeted with the creamy taste of the roe from within the fish. According to my mom, this Shishamo Kaarage is not as crispy and creamy, and it may be because it has been some time since it was prepared. She also mentioned that the fish was slightly salty for her liking and the special mayonnaise dip made it even more salty. Sadly, the dip was slightly too salty for her to figure out what was used in it. She could also detect some fishiness and it was not a satisfying side dish for her. Perhaps, this dish should be ordered when dining in so as to be able to taste its original crispness and freshness. 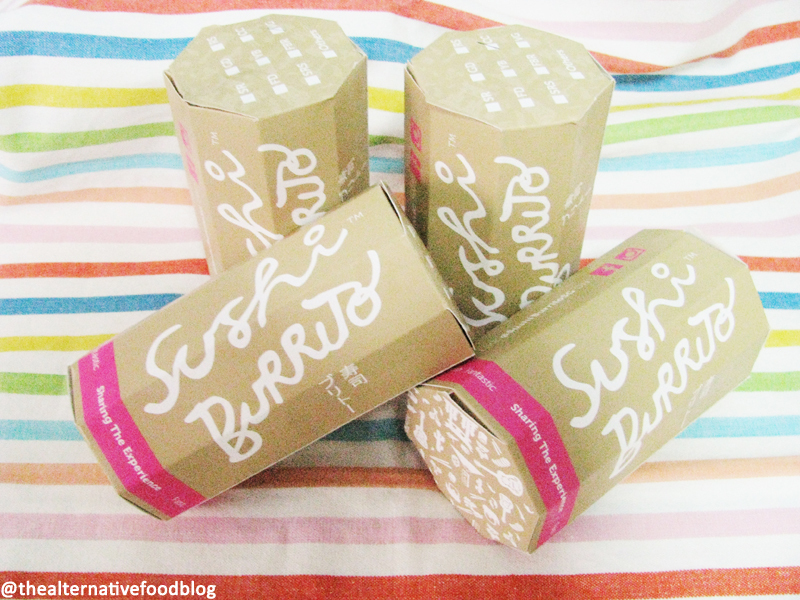 On the whole, I think that the concept of a sushi burrito is very creative and practical idea, as its packaging means that it can be eaten anywhere at anytime. 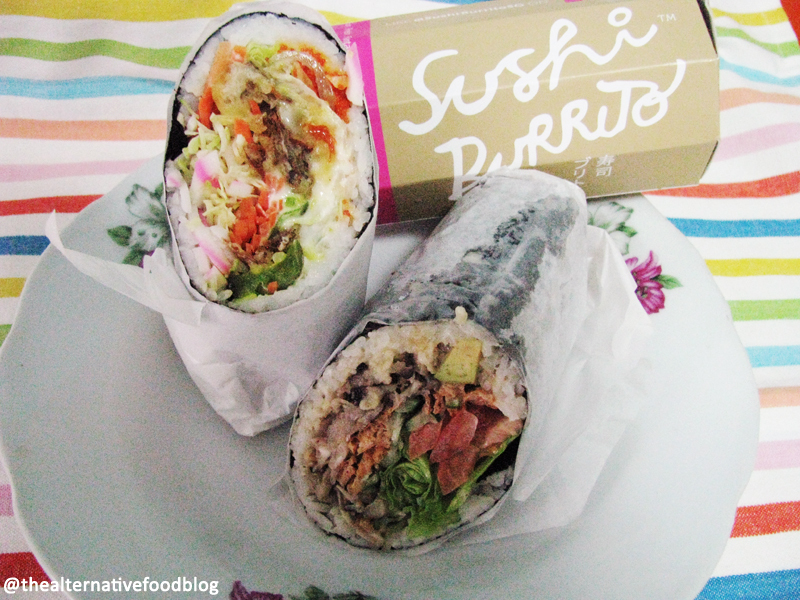 The packaging makes it suitable for busy people on the go which is probably why Sushi Burrito also provides delivery services to offices making it perfect for the clientele in the Tanjong Pagar area. However, it does not taste similar to the Japanese sushi we are more familiar with, so until I discover a new sushi establishment which provides alternative vegetarian options, I may just re-visit Sushi Burrito. How to get there: Nearest MRT Station is Tanjong Pagar. Buses to the vicinity: Bus 80 and 145. Halal Status: Not Halal-certified. Vegetarian options available. Our Verdict: ♡ ♡ / ♡ ♡ ♡ ♡ ♡ 2 out of 5 hearts. We hope you’ll be able to visit the original some day in San Francisco! Yes, hopefully we’ll be able to someday!